There is this amazing empanada place in my neighborhood that sells over 42 different kinds of the perfect handheld food–ranging from sweet fig and caramel filled ones to savory rice and beans. Deep fried and delicious these treats are anything but nutritious. I wanted to see if I could come up with a healthier version of empanadas that would also fulfill two very important requirements: the dish had to be handheld/easy to grab-and-go and something you would crave at the end of a long night. I think these empa-“not”-as do the trick. Filled with some of the best goodies of the season–fresh lacinato kale (also sometimes referred to as Dino kale), pomegranate seeds and purple carrot–and enveloped in a rice wrapper these are easy to eat on the go and the creamy mustard sauce makes them feel like a total decadent treat (at least to this cheese-deprived person). Despite being delicious, I fully admit these are not empanadas as many people know and love them. There is nothing Latin American about the flavor profile and these aren’t the fried stuff of junk food dreams. So I’ve dubbed them empa-“not”-as because, well, you get it. 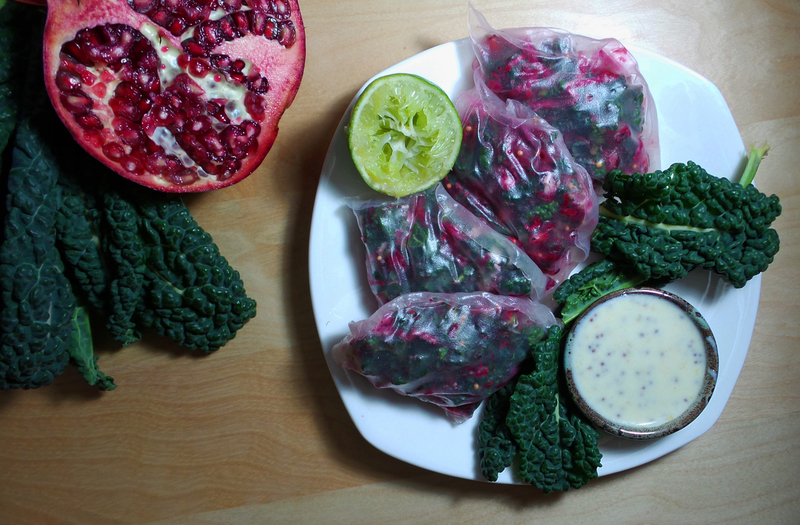 For the Kale and Pomegranate Empa-“not”-as: Combine all of the ingredients in a bowl, except for the rice wrappers, and toss until well combined–this is your filling. Using a clean pair of scissors cut the rice wrappers in half. Take a rice wrapper half, place it on a clean plate or cutting board and cover with a wet paper towel until it becomes just transparent. Be careful not to over-soak the wrapper it will become impossible to work with. Place roughly a tablespoon of the filling on one half of your wet wrapper. Fold the wrapper in half, lining up the edges. Seal the edges by folding them over, similar to how you would crimp the crust of a pie. Repeat with the remaining wrappers. For the Creamy Mustard Sauce: Add all of the ingredients to a bowl and stir until well combined. Serve as a dipping sauce with the empa-“not”-as. Makes 12. This entry was posted in Mains and tagged empanada, gluten-free, kale, lime, pomegranate, purple carrots, rice wrappers, soy-free, vegan, vegetarian. Bookmark the permalink.